This report summarizes the strategies in the Houston area’s toolbox and focuses on specific challenges. It also includes a variety of conclusions about how best to address both strategies and tactics. Consortium members believe the overall approach to mitigating flooding in a watershed should be focused at both the watershed and neighborhood level. Edition 1 provides information relevant to the local, state, and federal investments being discussed for flood mitigation projects in Harris County. It should be noted that Edition 1 is an interim report based on the consortium’s work to date and some work product on select topics is not yet available. A second edition of will include this information. To download this report (updated April 10, 2018), click the Learn More button. Scroll down to review the report's conclusions. We are seeing a paradigm shift in how the Houston area contemplates flooding and its consequences. From the general public to business to policy-makers—greater Houston must fully embrace this shift as to how the region responds to the challenges and consequences of flooding. In the past three decades, HCFCD and its partners have abandoned the previous approach of straightening bayous and lining them in concrete in favor of a new approach that uses detention basins and natural channel design. We have now seen that approach work in multiple flood events; completing projects already underway and extending this approach to more watersheds will help hundreds of thousands of residents. Based on the consortium’s work to date, we have drawn a number of key conclusions, which reflect the consensus of our members. In the coming months, watershed analyses will be completed, which will allow for more detailed conclusions. Edition II will include these findings. There is no way to completely eliminate flooding in Houston. We can only minimize its impacts. Most flood control assessments, including the federal government’s cost-benefit ratio, calculate benefits through economic value, not impact on human lives. Data about building slab elevations is critical to understanding the full extent of damages due to flooding depths. A flood risk mapping approach that estimates the likelihood of all flood scenarios will be more useful than the traditional floodplain mapping approach. The level of flood protection across watersheds is not equitable. An educated public is fundamental to building and sustaining support for the long work of mitigating the devastating impact of flooding in the Houston region. Robust public engagement throughout decision-making processes related to flooding mitigation will help improve results, ensure more equitable outcomes and build support and trust. Coordinating community-planning initiatives in each watershed would improve flood mitigation efforts. A countywide flood alert and warning system can be implemented cost-effectively and would be invaluable in future storms. Disclosing flood risks as a required part of any real estate transaction, whether it is a property sale or a rental contract, would help to ensure that owners and renters fully understand their flooding risk. The existing regulatory system overseen by multiple jurisdictions is confusing at best and possibly counter-productive. Counties have limited ability to enforce regulations in unincorporated areas. Under current detention regulations, new development, especially in previously undeveloped areas, still increases downstream flooding. Regulations should address the large areas of the region that were developed before flood regulations were in place. Many of the Houston region’s worst flooding problems are due to localized drainage, which often leads to flooding far from bayous. Projects that address this flooding can be as effective as bayou projects in reducing flood damage and human impact, but this flooding has not been adequately assessed. Some flooding problems are due to the limitations of local drainage networks, such as storm sewers and roadside ditches. Small-scale, lot-by-lot strategies, such as the regrading of lots or the widening of ditches to detain small volumes of water, can reduce the impacts of flooding in existing neighborhoods. Buyouts are currently being used as a way to address flooding that cannot be addressed with new flood control infrastructure. Instead, they could be studied alongside flood control infrastructure to determine what the most effective and least expensive solutions are for each watershed. Voluntary buyout programs could be more effective if they are done with extensive public outreach and coupled with active case management and generous relocation assistance. Without a coordinated housing plan that creates new housing concurrently with buyouts, extensive buyout programs could significantly reduce the supply of affordable housing in the region, and more people will agree to buyouts if viable relocation options made possible by an affordable housing plan. In addition to buyouts, home elevations, flood-proofing and acquisition of property for reconstruction can be useful tools. Increasing channel conveyance capacity in and of itself is not the most effective flood mitigation strategy. Where watersheds remain undeveloped, acquisition of land along the bayous and creeks is a cost-effective flood mitigation tool. The current federal projects on Brays Bayou, Clear Creek, Hunting Bayou, White Oak Bayou and Greens Bayou are valuable. 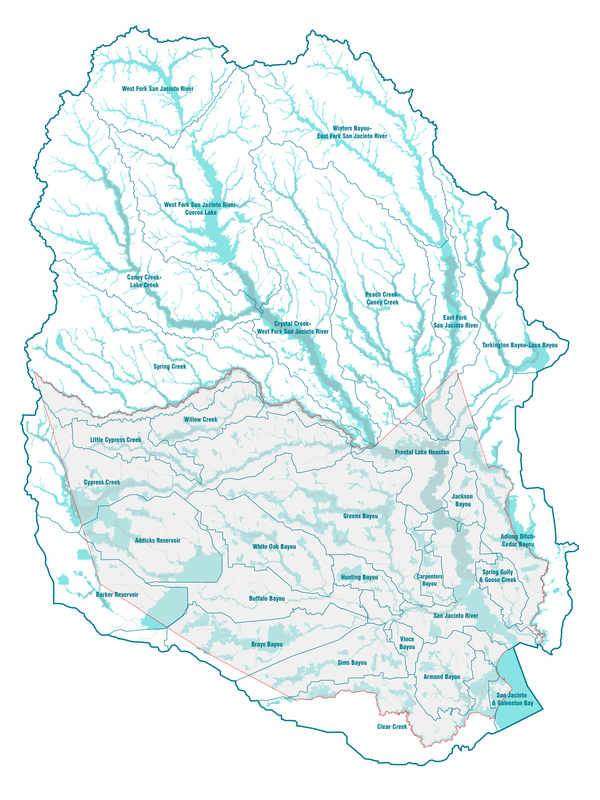 There are opportunities for additional detention, bridge reconstruction, channel improvement and land acquisition projects in all of these watersheds. The federal projects on major bayous do not address all of the tributaries of those bayous, some of which have had considerable flooding. Several key watersheds, including Cypress, Creek, Armand Bayou, Vince Bayou, Luce Bayou and sections of Green Bayou, have seen considerable flooding damage but have not been fully studied in detail or had projects identified. Many of the bayous have flooding issues caused by roads, highway bridges and railroads that restrict the channel. Collaborative efforts between the HCFCD, railroads and TxDOT could address these. The cumulative impacts of the various flood mitigation proposals for the San Jacinto River are not fully understood. The potential failure of Addicks and Barker reservoirs is likely the most dangerous flooding scenario in the region, and the ongoing USACE study needs to be completed as soon as possible to know what the risk of that failure is and how much investment is required to keep the reservoirs safe. The “third reservoir” as proposed is primarily intended to mitigate new development, not reduce flooding in Buffalo Bayou, and does not solve the issues with Addicks and Barker reservoirs. A new reservoir in northwest Harris County specifically designed to address the Cypress Creek watershed could mitigate repeated flooding along Cypress. The “north canal” near downtown Houston could significantly reduce flooding along White Oak Bayou and Buffalo Bayou in downtown. There are 30 watersheds, 25 of which are in Harris County. Some are large, some are small, some densely populated, some rural. All have experienced considerable flooding. This document catalogs flood infrastructure plans in all of these watersheds. It includes proposed projects (whether funded or not) as well as projects that have been completed since the early 1990’s or are under construction. These include projects by Harris County Flood Control District (HCFCD) and the United States Army Corps of Engineers (USACE) as well as projects by other public entities and projects proposed by private interest groups. To download this report (updated April 10, 2018), click the Learn More button.